where did all that cheese come from? I was going to title this post “leftovers” but it sounded so uninspiring I did think of “bits and bobs” (a phrase a friend uses when answering her children’s question “what’s for lunch?”) “endless little bowls and tupperware boxes” (which is what my mother’s fridge is often full of) but as cheese is the decluttering item in question today I went for the one above. The Boss and I were in Italy a couple of weekends ago. Consequently (a) I filled the fridge with food for the girls lest they should starve (as they are very good cooks in their own right I am sure that was unecessary but hey I’m a Mum) and (b) we bought rather a lot of cheese and salamis, bresola and lardons back with us. Combine that with my inability to throw anything away and the result was fridge overload. Leftover cooking here I come. 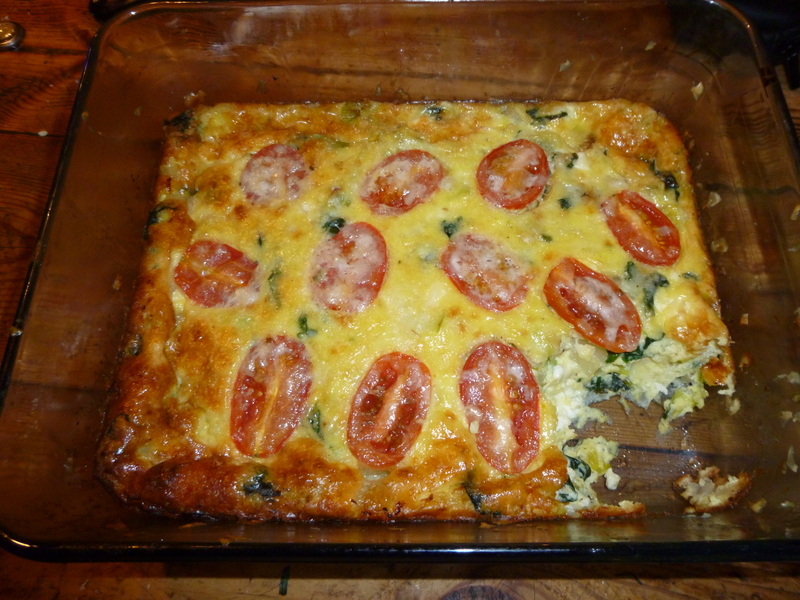 First up is a made up cheesey bake. You will note the lack of precise amounts because I just shoved in what I had. Sweat onion, garlic and leek. Beat eggs with cream until it looks about right. Add crumbled feta and chopped mozzarella. Halve tomatoes and place cut side up in mixture. Grate however much gruyere you have over the top. Try not to eat it all as soon as it comes out of the oven. I am afraid I had a taste before I remembered to take a photo. By now there is an entire strip missing. It was DELICIOUS. Obviously you can mix and match to use whatever is in your fridge, most cheeses will be fine and you could experiment with the vegtables. I like the tomatoes because they give a slight edge to what could otherwise be a rather rich dish (in the same way I add tomatoes to macaroni and cauliflower cheese). Next up is cheesey tear and share bread. Now this is a “proper” recipe as you can’t really guess with bread. It’ from Jo Wheatley’s Home Baking. I am only at the second prove stage so can’t tell you what it tastes like but thus far it feels rather heavy. It was a pain in the neck to knead (I always knead by hand) and never reached the light stretchy stage I would usually expect. Having said that it rose well in proove one, I’ll let you know how it turns out. Tip the flour, yeast, salt and sugar into the bowl of a free-standing mixer fitted with a dough hook, or a large mixing bowl. Mix together to combine and make a well in the centre. I did this by hand. Combine the butter, herbs and garlic in a food processor to form a paste . I did this by hand too – does this woman have an army of people to wash up after her?! Add to the flour mix. In a jug, mix the boiled water with the milk and egg and slowly add to the dry ingredients. Mix until combined, then knead for 6 minutes in the machine or 10 minutes by hand. 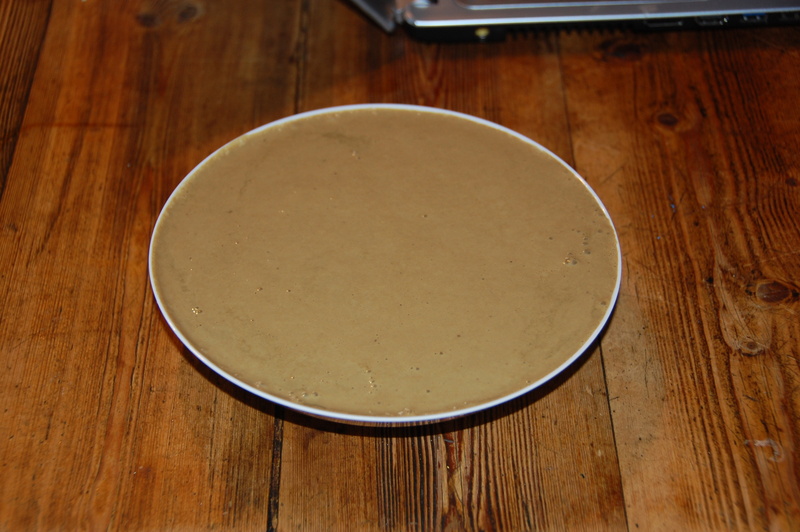 Cover with oiled cling film and leave to prove for at least 90 minutes or until doubled in size. Turn out onto a lightly floured work surface and knead for 30 seconds to knock back the dough. Divide the dough into 14–18 pieces and roll into balls. Mix the two grated cheeses together and set aside one third. Make an indent in each of the dough balls, divide the cheese between them then seal up the dough. Place the balls on the two prepared trays: start with the middle rolls and build around them. Preheat the oven to 200ºC/400ºF/Gas Mark 6. Brush the buns with egg wash, sprinkle over the remaining grated cheese, and bake in the oven for 18–22 minutes until golden. I will not be usuing mozzerlla or gruyere as I used them up in the last recipe and will instead be using a selection of old heels of assorted cheese last seen mooching around the back of my fridge. Finally Cheese straws. I also happen to have some puff pastry in the freezer so the last of the cheese will be used up. What is lurking in your fridge? What could you turn it into rather than feed it to the bin or the compost? Leftovers have played a large role in my life. Perhaps because my parents had the war fresh in their minds they ensured that no food ever went to waste. There were times when I would open the fridge door and stare at rows of little bowls of tiny amounts of food and despair, but on the leftover front I turned into my mother at a very early age. I am particularly proud that I can feed a family of five on a decent lamb roast for three days and still have leftover cold meat for lunch/sandwiches (plus the bone for the dogs). Roast on Sunday, shepherd’s pie on Monday and Stovies on Tuesday. However, this post is about a different kind of leftover altogether. The Boss makes his own beer. It is lovely, although the smell can be a bit overpowering at times if you don’t like that kind of thing. It also produces copious amounts of this as a side product. Brewer’s yeast. This time, before pouring it away it occurred to us that I could use it for breadmaking. It was still rather runny so I ran it through a muslin. Next time I wouldn’t bother. First almost all of the yeast goes through in the liquid, you do get a tiny brick of yeast at the end but it seemed an awful waste of the rest. I did try an put it through a second time but the same thing happened. Secondly, if you have teenagers in the house they will make endless comments about the unspeakable things taking place in the kitchen and compare you unfavourably with parents who are normal. So I just put it all in a small container, left it to settle and whoppee, a couple of hours later there was a lovely thick sludge at the bottom and I could pour off the excess liquid from the top. 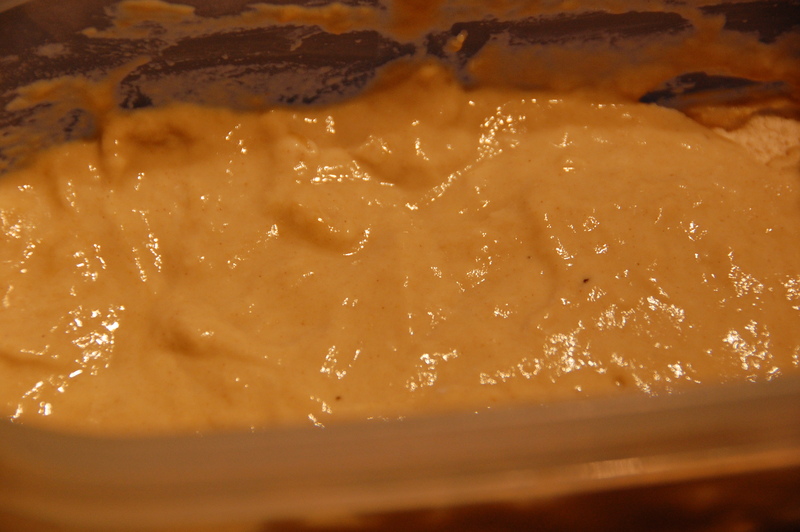 The best recipes suggested using the yeast to make a sour dough starter. I used this one from Ko-bo. Here is the starter on day one. 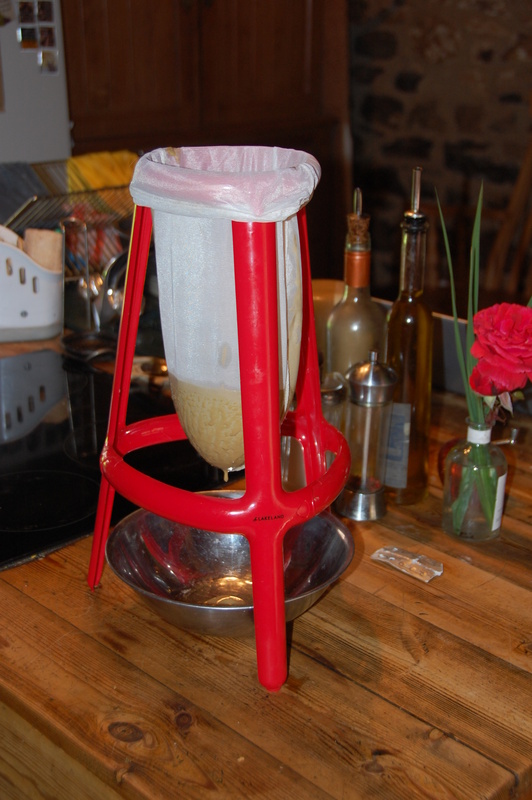 The addition of honey is inspired because it adds some richness and takes away any potential bitterness from the brewers yeast (a common complaint from many of the bakers I researched). 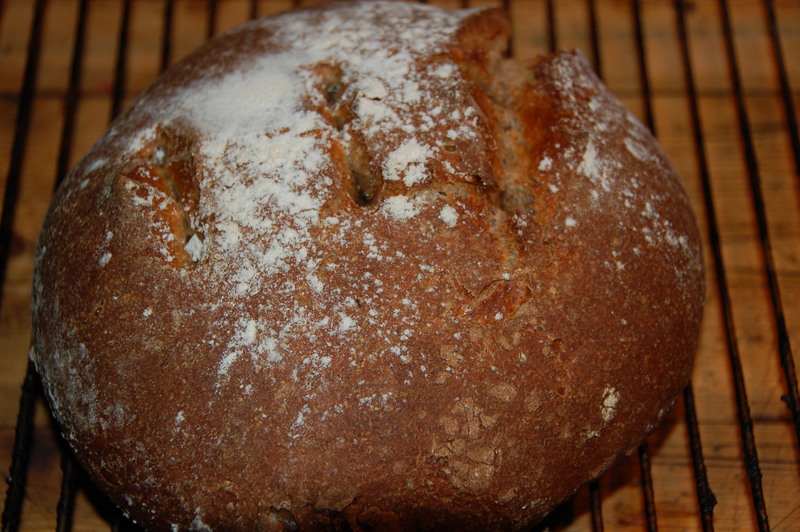 I didn’t have any malt barley and added some rye flour and crushed mixed seeds. Here is the finished result. It rose a vast amount on the first rise, but less so on the second. I am tempted to cook it without beating it down next time, just to compare the difference. It is a very tasty loaf with a dense but crumbly crumb. Also Ko-bo makes a small starter and uses all of it. In more traditional soughdough style I have made double the amount and am going to keep it going. Which does of course mean I have rather a lot of brewers yeast going if anyone is interested. Breakfast this morning. 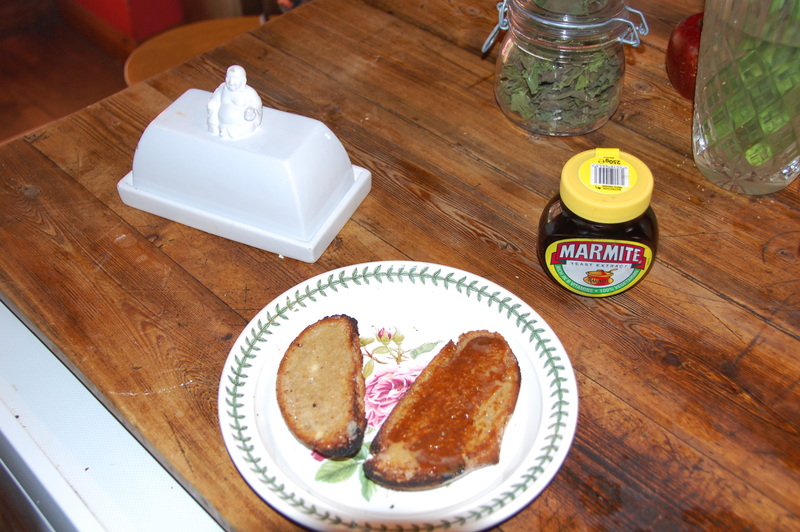 One slice with just butter and one with marmite. The latter may seem a bit of overkill if I am taste testing, but I love it so much and anyway, it’s practically a first cousin to the bread! It is hot today, well certainly for the north of England. Currently 25 degrees (about 73 for those working in farenheit) and stuffy. I can’t believe I used to live in the tropics, I must have been made of much sterner stuff when I was younger. 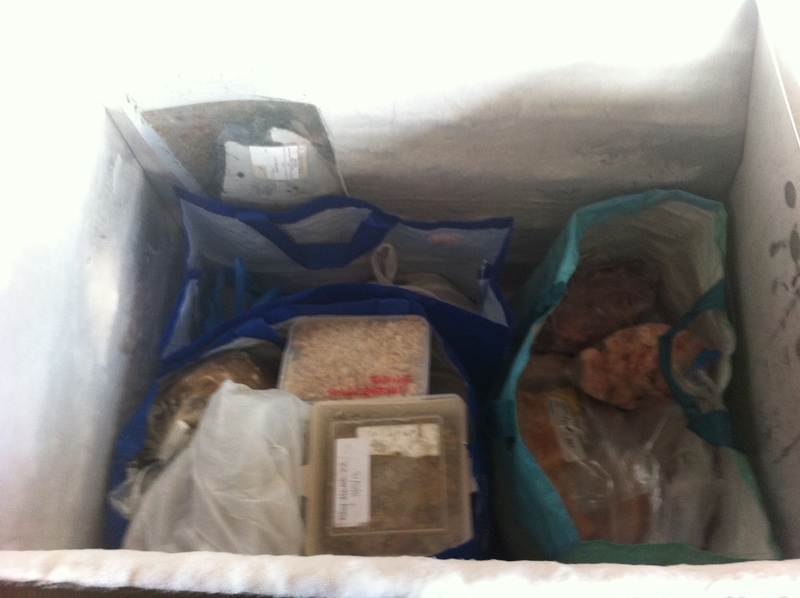 However, it did mean that today was the perfect day to sort the freezer….. This is one of our most shameful areas. I have tried all sorts of strategies to keep on top of it but none of them have lasted much longer than a month or two. We have three freezers. A small freezer below our fridge in our kitchen; a chest freezer and a small freezer in the outbuildings. The fridge in the kitchen is the main daily use freezer. The one I use first when working out what we are going to eat the following week; the one the ice cream lives in; the ice box and any herbs I have frozen for over the winter. 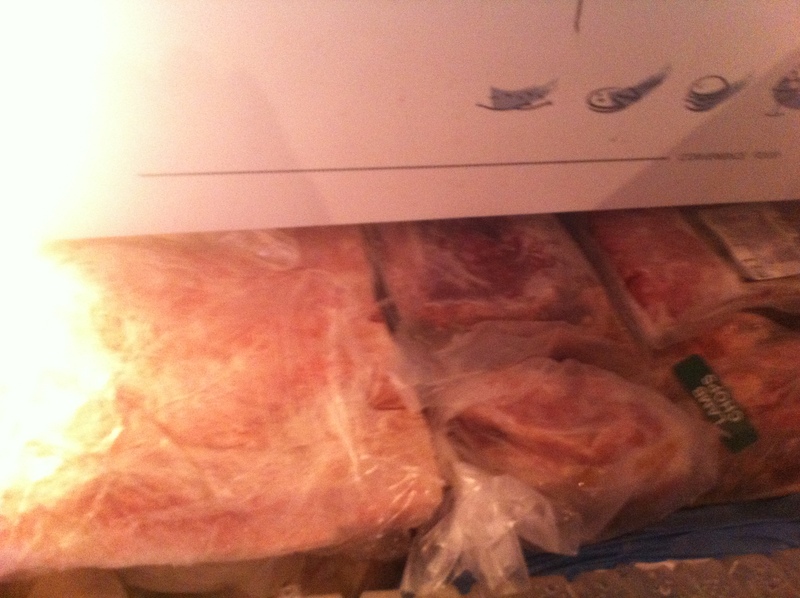 The chest freezer is meant to be for fish (my husband is a trout and salmon fisherman) and whole or half animals bought direct from the farmer; freeze ahead meals (especially over the Christmas holidays); leftovers sufficient for another meal for at least 2 people; bones and meat for the dogs; odd stuff my husband buys when he is let loose in the farmers’ market on his own. Though as I bought an alpaca steak last time I went to the Hexham market I can’t really complain about the Desperate Dan Pie he bought. Finally there is the small freezer used for fruit. We have a lot of fruit bushes and trees gooseberries, redcurrents, blackcurrents, apples, damsons, plums and quinces. We also have raspberries, strawberries, cherries and blueberries, but they never last long enough to make it to the freezer! Everything comes to harvest at once and I can’t can and jelly it all in one go so it goes straight into the freezer along with any foraged fruit (sloes, rosehips, elderberries) and I do bulk sessions at my leisure. In theory it should work well. In practice it is chaos, not even of the organised kind. So out it all came. There was a shocking amount that fell into the unidentifiable category and combined with the dog meat and bones which had got wedged under a whole side of smoked salmon the dogs will be well fed this week. Then there were the soups. Now I like soup as much as the next man. My husband should have married the Soup Dragon. He makes soup by the gallon, thick broths and lentil soups made using a ham bone from a mutated pig the size of a shire horse and so thick they could be served by the slice. The one kind of soup I can’t stand. The problem is he makes it, bags it up and then forgets about it and makes some more. Henceforth he is banned from even mentioning the word “stock” until he has eaten at least 2/3 of the soup lake in our freezer. The most interesting bits were the unused cuts from the whole lamb we get each spring. I am the only person who likes heart so I usually have that braised on a cold night whilst everyone else wrinkles their noses at me and snaffles some kind of dubious takeaway. I have plenty of recipes for skirt and breast and all those other cheap cuts that nobody else wants but even I was baffled by these. I have added them to the dog pile. Finally the leftovers. ” Bolognese sauce for 5″ is brilliant; “lamb hot pot for 2” could do my husband and I for lunch; unidentifiable meat dish dated October 2010 I thought could probably go. But more importantly what I have learned and what will I do differently? 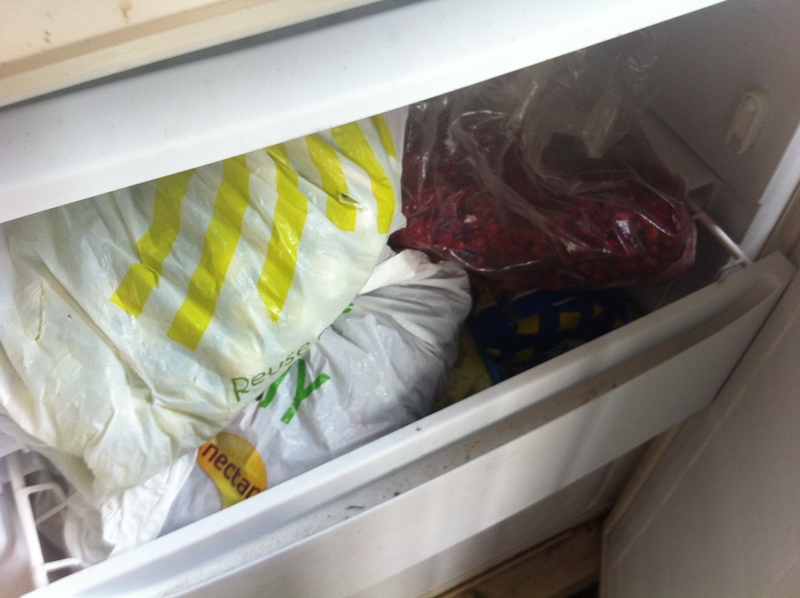 Bags – sorting stuff in the big freezer by bag avoids loosing dog food under the salmon. I have a raw meat and fish bag, a cooked meals, soup and stock bag and a breakfast bag (bacon, black pudding, white pudding, fruit pudding and kippers). All menu planning to use existing stocks in the kitchen freezer before going to the outside freezer and finally the farmers’ market. Cut down on game purchases. Only my husband and I really like game, I can sneak it in to casseroles for the girls but they have been suspicious ever since they discovered “dark beef” was venison and “dark chicken” was pheasant! We do get given game by friends who shoot and my husband has brought the odd animal home himself but they tend to get eaten immediately. It’s the partridge picked up at the farmers’ market that just never gets eaten. The venison liver, which to be fair looks delicious but again as only my husband and I eat liver and game it’s not going to see the light of day on a regular weekday evening. Leftovers. Is the reason there is so much left over because I efficiently cooked twice the amount, because unexpectedly half the family were out for supper or because it wasn’t a great recipe? In the latter case there is no point putting it in the freezer because nobody is going to eat it. A rather odd chicken and chickpea curry fell into that category. Never put milk in the freezer. Nobody ever remembers it is there. If I’ve not turned it into jelly or canned it by December I’m never going to do it. 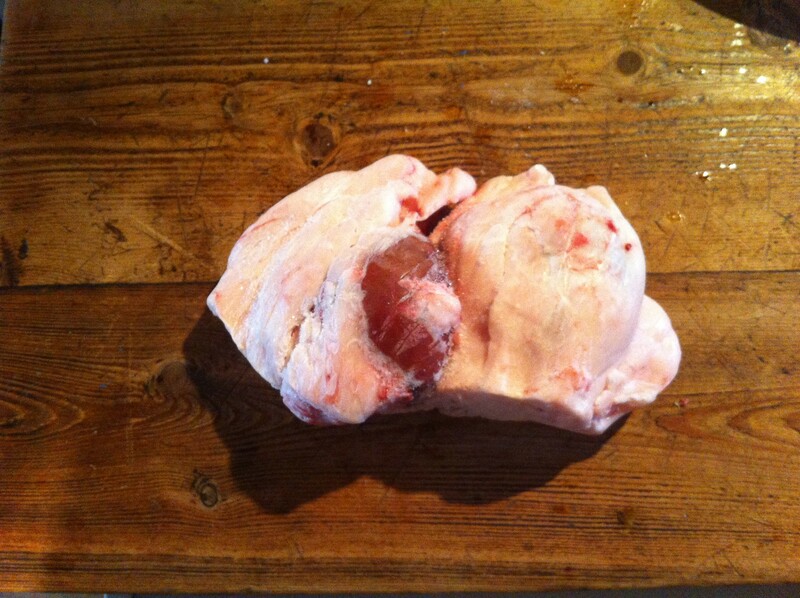 PS loved the fact that WordPress spell check doesn’t recognise kipper or chickpea – foodie philistine!